In 2013, The Collector was one of my most anticipated reads. Dante Walker rocked my world, and I absolutely adore Victoria Scott for creating him. 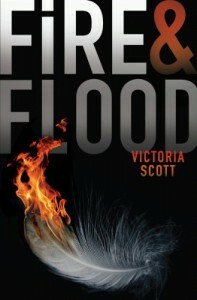 This year, she's releasing Fire & Flood, and it sounds nothing like Dante's series. It sounds a lot like The Hunger Games meets The Amazing Race. *Intrigued. * I love it when authors surprise us with something completely different than what we know them for. Fire & Flood releases on February 25th, a mere three weeks from now and I, for one, am counting down the days. As a little treat, I received this little nugget to share - an excerpt from Victoria Scott's newest release. Enjoy!! “If you are hearing this message, then you have successfully completed the Pandora Selection Process. It also means you are now at the official starting line.”Around me, Contenders whoop with excitement. Seriously? They’re about to plunge into a wild jungle, and that brings them happiness? Once again, I realize how out of my league I am. I don’t even have a change of clothes, for crying out loud. “As you may have realized, you are on the outskirts of a rain forest. This will be the jungle part of the course. You will have two weeks to arrive at the jungle’s base camp. You will find this base camp by following the path of blue flags.”Contestants glance around, immediately looking for the first blue flag. As for me, I’m watching the taillights of the semi and having a massive coronary. “If you are the first to encounter a blue flag, you may remove it, but you may not remove the stake it is attached to. Doing so will result in immediate disqualification.”I wonder why anyone would want to remove the flag to begin with. No one else seems concerned by this.